After my stay at my parent’s, my next break was in Bangalore with my in laws. They wanted some exclusive time with their new grandson and I was happy to oblige. We had some quiet family time together. The meals served on my in laws table have always been immaculate and things rarely go wrong. Right from the way the table is laid to the food itself, everything has a certain degree of perfection to it. One of my first meals with my in laws was a north Indian dinner served in the garden in my mother-in-law’s exquisite antique copper dinnerware. 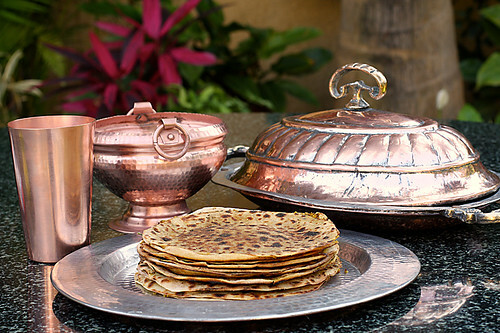 When Maya, my in laws cook was making Gobi parathas for breakfast, I wanted to take pictures of them in her copper dining set and it was my mother-in-laws lovely idea to shoot them in the garden. The ajwain or the carom seeds add a special touch to these parathas. You could substitute the grated cauliflower with mashed potatoes. Mix all the ingredients for the dough and knead into a semi-soft consistency using enough water. Allow the dough to rest for at least ½ hour. In a wok, heat the oil over a medium flame. Lower the flame and drop in the cumin seeds, asafetida, ginger, green chillies and turmeric powder and cook for a few seconds. Put in the grated cauliflower and raise the heat to medium. Stir and cook for about 3 to 4 minutes until the spices properly coat the cauliflower. Put in the cumin seed powder and fresh coriander. Turn off the flame and allow the stuffing mixture to cool. 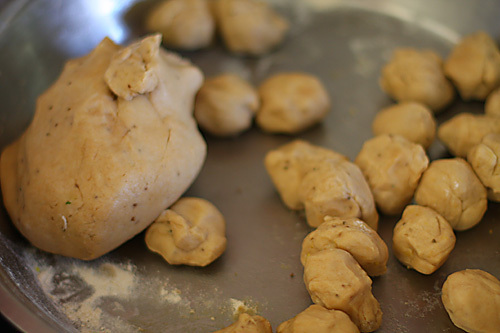 Divide the dough into 12 small balls. On a flat surface using a rolling pin, roll each dough into a 5” round disc using a little flour. Take one round disc. Place a little stuffing mixture and spread it, leaving 1/4” space around the edges. Place another round disc over it and seal the edges using a little water. Cook on a hot griddle using a little oil or ghee until golden brown spots appear on the surface. Serve hot with pickle and plain yogurt. Family bonding is something which we are missing in fast running life's…..nice to see u r having good time…..gobi paratha looks extremely yummy…..love that easy to understand pictorial…. Anushruti those Paranthas look so good! I feel like having some right away! Great pictures! The house pictures are gorgeous. Immaculate as ever. And nostalgic too. And the gobi paratha looks yum. 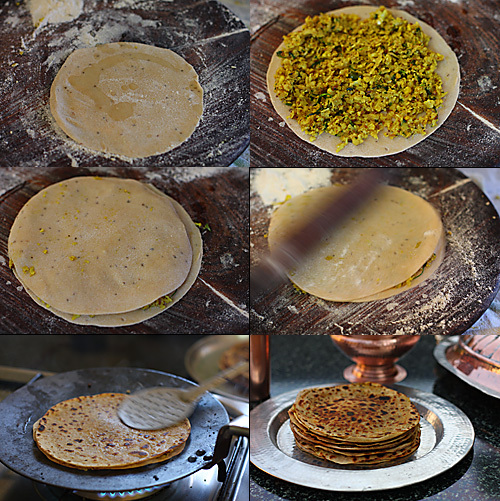 Great clicks as usual and yummy parathas! Don't the parahas split open when made in this method ? I cannot wait to try this recipe. It looks amazing. The house looks so inviting and warm. I wish I could be there! Kiran: The edges of the rolled dough are sealed with water. So they don't split. EI: You are most welcome anytime you visit India. Beautiful home and mealtimes sound a dream! Lovely spending time with family; I miss that. These pancakes sound fabulous! I must try them! Thanks for the recipe! This looks wonderful…l really loved your presentation and all those beautiful copper pieces. I have a big cauliflower in the fridge waiting for this recipe… thanks!!! Your in-laws sure have a beautiful place!! Sounds like you had a great time, with great people. I love parathas, and those look fabulous!! Wish I could eat some, right now!! 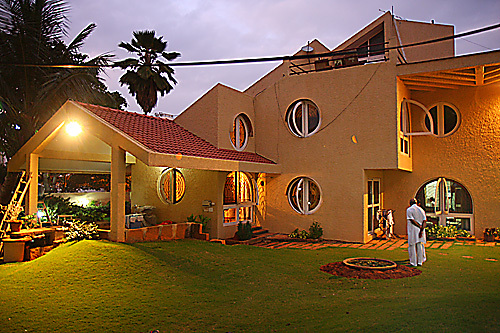 And I must say, what an emmaculate home – in and out!! The lawn looks so fresh and that rare copper set, so precious..
Ashwini: So happy you enjoyed these parathas Ashwini…great going…look forward to feedback from you on other recipes as well. I usually making parathas by stuffing the filling and rolling out the paratha. I tried this method with not-so-ggreat results. The inner side of both the rolled discs remained uncooked-only the outer side got cooked. Can you please tell me what I might have done wrong? Niki: Seems like your rotis were thick in the centre and thin outside. Try and roll thin rotis which are even all over and cook it on medium heat and you won't have this problem. Infact, this method is easier than the other method of making parathas.